Petra by night. Photo sourced from the Jordan Tourism Board. 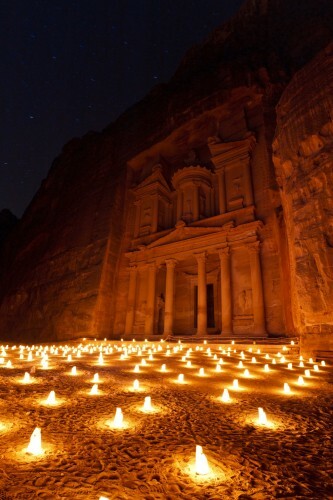 The moon shone brightly, illuminating the façade of the Treasury – the most famous of the monuments in Petra, an ancient city in southern Jordan. In the square directly in front of the Treasury, hundreds of candles cast a warm glow on the faces of the people who had come to experience Petra by night and to listen to a Bedouin musical performance. The crowd’s excited chatter quickly dissipated when a Bedouin man appeared. He took out a flute from his pocket and within moments mesmerised the crowd with his hypnotic tunes. Couples huddled together on the carpets as the Bedouin continued his performance with a series of melancholic songs. The atmosphere was simply magical. The crowd slowly left the square after the Bedouin’s final encore. I stayed back to take a few more pictures when I noticed a couple walk, hand in hand, to the centre of the square. Surrounded by a sea of candles, they stood silently, their eyes glued to the magnificent Treasury. The man whispered something into his companion’s ear and she laughed. She was still smiling, visibly filled with glee, when the man slowly lowered himself onto one knee, his hands never leaving her’s for one moment. Her smile turned into an expression of surprise. I was too far away to hear what he said but it was obviously a marriage proposal. Her response was equally obvious: she nodded excitedly before pulling him up for a passionate embrace. They laughed and danced in a small circle, the candles illuminating their every movement. By this time, I wasn’t the only person who’d noticed what had just happened. The Bedouins burst into song and people started clapping. It was a small, intimate celebration at a breathtaking location. I’m not sure if the man had planned it beforehand or if he was simply inspired by the enchanted setting but I couldn’t help but think that this is the perfect place to propose… and a magical place to say “YES!”. 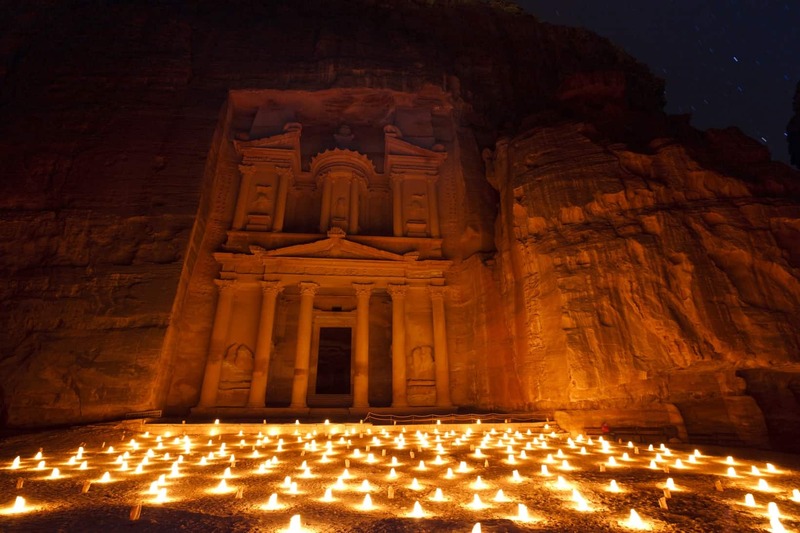 Seeing Petra by night is absolutely one of the most romantic things to do anywhere around. Hundreds of candles line the Siq, the mile-long gorge which leads visitors into the city. As you walk atop cobblestones that are more than a thousand years old, you’ll be struck by the views of the moonlit gorge and its wavy appearance. The highlight appears at the end of the Siq when the Treasury building slowly comes into view, cloaked by a faint glow from the sea of candles at its feet. The Bedouin’s musical performance creates a wondrous atmosphere that oozes romance. One of the most romantic settings anywhere around! Photo sourced from the Jordan Tourism Board. Seeing Petra by night was a moving experience and as I strolled through the Siq, I couldn’t help but think how special it would be if I had a loved one at my side. I’ve made a promise to myself that I will one day return… this time, not alone. If you’re planning to pop the question or if you’re looking for an ultra-romantic experience with a loved one, Petra by night is the perfect place to be. Read about other things to do in Petra or things to do in Jordan. Note: a big thank you goes to Visit Jordan for their gracious hospitality. What a romantic scene! Definitely a lovely place to propose. The moonlit walkway is also another breathtaking site to see. Thanks for sharing your experience, and good luck on future travels! Keith, the night shots are fantastic. I’m really enjoying the posts about Jordan being showcased by you & other travel bloggers. Hah! That’s an excellent question. I wondered the same when I was there. I imagine the Bedouins/locals who work in Petra. Must be an enormous job every evening! Who lights all the candles Keith? Is it done every night? We are headed to Jordan next year in April and cannot wait! I dream of Petra every night! Haha.. beautifully amazing. Thanks for a great post Keith! Beautiful, Keith! Glad to hear you enjoyed your visit…and YES, it would an ultra-cool occasion for the Big Ask!! Thank you Juno! Hope you’re well. 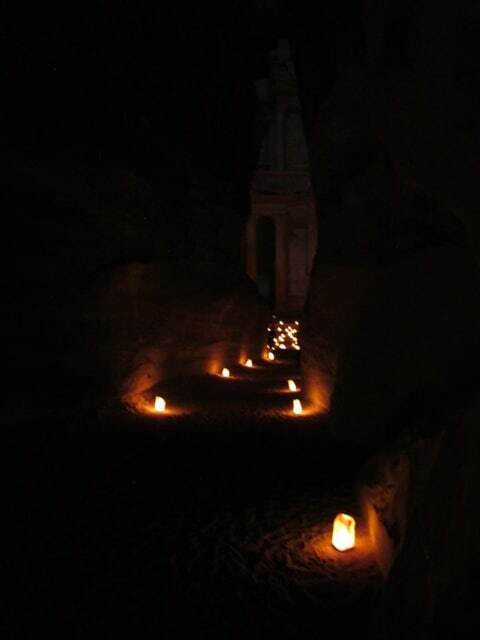 Petra really is an amazing place and a very romantic one in the evenings when the candles are lit. You’ll absolutely love it! What a romantic you are Keith! I would have never thought of Petra as being the perfect spot to pop the question or as a romantic place. It looks so romantic there. Hi Michelle, thanks for your comment. It was certainly a magical moment! I’ve never seen anyone propose before (only in the movies). 🙂 Petra was absolutely the perfect place for it.